Dubai, UAE, November 06, 2018: Putting your best face forward, both professionally and personally, empowers you to do more. However, the inevitable process of ageing, which manifests as wrinkles or age spots, can find you searching for ways to rejuvenate your skin. In your search for age control solutions, such as Botox, Dermal Fillers or Thread Lifts, it is highly possible that you may come across advertisements offering massive discounts or bargain deals. Very often such deals list prices that are way below what is normally charged in a licensed clinic or hospital—making it tempting for you to try out. But how safe are these deals? And is it worth to take on the associated risks of choosing price over quality? We explore the reasons as to why it is always important to choose quality over price when it comes to minimally invasive age control solutions. In 2017, the Ministry of Health and Prevention in UAE warned of a rise in unlicensed back-street beauticians offering cosmetic procedures for a fraction of the price of regulated clinics. Such illegal clinics were found to conceal patient medical reports in violation of the country's Medical Liability Act. The warning was primarily issued because age control treatments like Botox and dermal fillers are specialised medical treatments that require the use of FDA-approved products and are to be performed only by highly trained and licenced dermatologists. If you have been offered age control solutions at cheaper that average prices, beware of a hidden catch. Take for example Botox. It is a prescription drug and requires a licenced medical professional to prescribe its usage. FDA approved purified, injectable botulinum toxin is sold at a standardised price. So, if the prices you have been offered are discounted, it could only be because of any one of the following reasons. One, the drug being used to smooth out wrinkles is not FDA approved, and has been obtained illegally. Two, the injectable drug has been diluted. And three, the drug has crossed its expiry date. Using expired or non-FDA approved variants will not just increase the risk of infections and disfigurement, but even cost you your health. The side-effects range from skin irritations and allergic reactions to serious issues including nerve damage, facial drooping, blindness or paralysis. And if the injectable drug has been diluted, you will not experience the results that you have paid for—turning what you though was a discount into a complete waste of your time and money. Most of the discounted age control solutions that are offered at low prices do so because the procedures are not done by trained and licensed dermatologists. In March 2018, Dubai police apprehended an unlicensed person treating individuals with Botox injections. The illegal so-called beauty operator was using a residential flat as a clinic to perform the procedures. While an age control treatment Botox or fillers may seem easy to administer, such a treatment requires an in-depth knowledge of the anatomy and physiology. Only a dermatologist will have the knowledge of the exact location of the facial muscles, nerves, blood vessels, etc., in addition to being trained in knowing how exactly to approach your individual skin concerns. For instance, if dermal fillers are accidentally injected into a blood vessel, it can lead to potential skin loss. Furthermore, only a dermatologist can advise you on the right time to get a facial filler. For sometimes, getting a filler while battling a sinus infection or after dental treatment can prove to be dangerous as any infection in the facial area can lead to the injection site being affected. Similarly, only a highly trained dermatologist will be able to help you get a perfect smile line. An experienced practitioner is almost an artist who can define your lip shape with just the right amount of filler. In the hands of a non-professional, too much filler can be added leading to your lips taking on an unnatural ‘trout pout' or ‘duck lips' appearance. In the case facial threads, when performed by someone who has not been expertly trained, you can end up with complications including visible knots and dimpling of the skin—which then again would need surgery to be corrected. 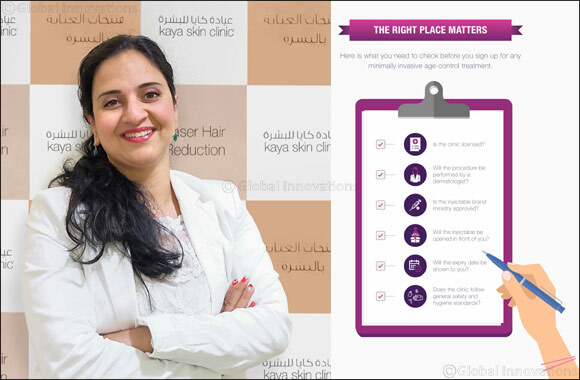 Dr. Mansi Mukherjee - Head of Resources and Medical Innovation at Kaya Skin Clinic said: When it comes to your skin, you always want the best. Check for quality by ensuring that you get treated at a reputed clinic that uses FDA-approved drugs. A reputed clinic will also have on board trained dermatologists, who will give you expert advice on the best age control solutions that will solve your specific problem. Moreover, you should ask the following questions before you sign up for any minimally invasive solution. Is the clinic licenced and the doctor adequately qualified? What is the brand being injected? Is it ministry approved? Is the filler being opened in front of you? This is to ensure hygiene and quality. 4What is the expiry date? Are general safety and hygiene standards being followed in the clinic? This includes usage of disposal needles, sterilization of equipment, cleaning and removal of waste, avoiding cross contamination, etc. Most reputed clinics do offer slight reductions on prices, especially if you take a package deal, or if you are first time user. However, more than the discount, the results you get—a younger and more confident you—will be your best deal. Next Story : The Incredible Power of the Mushroom!